SPRINGFIELD, Mass. 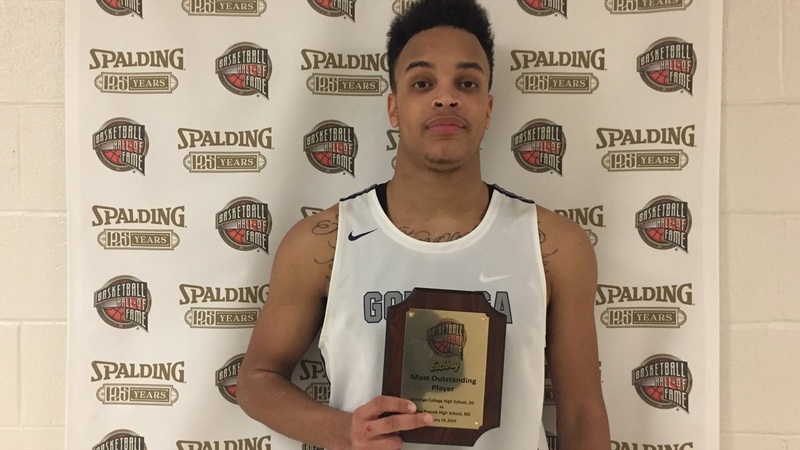 – It wasn’t the start Gonzaga College High School had envisioned as the Eagles from Washington, D.C., fell behind quickly in their game at the HoopHall Classic against Olive Branch from Mississippi on Saturday night. But the Eagles, led by 2020 forward Terrance Williams, rebounded and finished with a 69-56 victory. “We came out in the second half and bounced back,” said Williams, who earned Player of the Game honors with 27 points and 10 rebounds. Williams has seen his hard work in the offseason translate to court this winter. “I’m excelling at stretching the floor, shooting,” the 6-foot-7, 210-pound junior said. “I’ve been working on that all summer; getting a lot of wing moves, dribbles, catch-and-shoot, stuff like that, which is going to translate to the next level. I think that’s what I’m doing best right now. Williams said he’s blessed to be in the position he’s in with double-digit offers from some of the nation’s top programs, but also acknowledged it can be stressful at times. Williams pointed to Virginia and Stanford as the two schools coming after him hardest at this point. Stanford head coach Jerod Haase has also made an impression. He’s already taken official visits to both and listed Georgetown, North Carolina State and South Carolina as schools he’s planning to visit in the future. Notre Dame is another school he’s been hearing from for a while as well. Williams said an offer from the Irish would “definitely” put them among his group of top schools. He’s not in a rush to bring the process to a close or even narrow his list just yet.